My house in Strawberry Hill overlooks Twickenham Green. 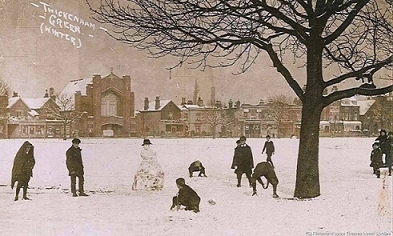 Twickenham Green was once part of Hounslow Heath and used to be called Twickenham Common. The 1753 engraving by Thomas Boydell of Twickenham Green, or Common, shows the entrance to my road next to Gifford Lodge, my next door neighbour. Holy Trinity, a Grade II Listed church built in 1841, is on the same side of the road as Gifford Lodge; it was extended in 1861 because of the increase in the number of homes in Strawberry Hill. Today, Twickenham Green also has three Indian restaurants, two pizza restaurants, a cocktail bar and restaurant, a pharmacy and local supermarket. In fact, it is almost like a small village, with two local pubs nearby. 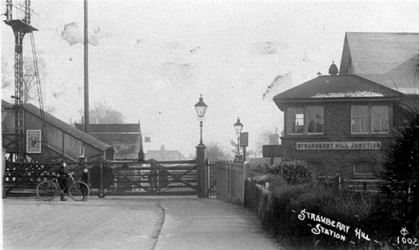 Strawberry Hill Station at the end of Popes Avenue, was opened in 1873. 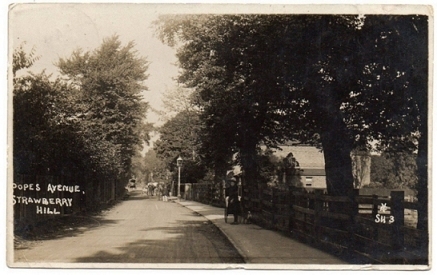 The postcard shows the bridge which is still there today. Like Holy Trinity church on Twickenham Green, Strawberry Hill Station was opened because of the increasing population; the station itself leading to housing development. The Post Office, opened in 1905, was the first shop in Strawberry Hill village. There are now a few more shops including hairdressers, an off licence, a chemist and a convenience store. There is also a Volvo service centre in the village and Strawberry Hill Golf Club, opened in 1900, is a minute or so from the station. Strawberry Hill has a village feel and Twickenham Green, surrounded by trees and with a cricket pavillion, is like a country village but in south west London. Add to this a short walk to Radnor Gardens, a beautiful public garden on the Thames with a light and airy hotel opposite, it would be hard to find a more desirable spot within easy reach of a number of local towns. Prado's Grapes, Gifford Lodge, Pope's Legacy, Walpole's Strawberry Hill House, Grand Neighbours - Richmond House.